Brand New 3 Lamp / Bulb T8 LED 66 Watt Strip Light - Warehouse, Shop, Commercial Grade Light Fixture (3 LED Tubes Included). Listings: UL Listed, DLC Approved. Bulb Life: 50,000 Hours L70 + (still at 70% brightness after 50,000 hours). This fixture is direct wired for single ended LED tubes. 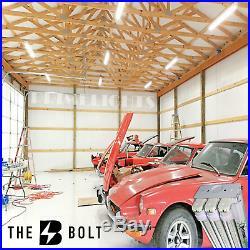 There is no external driver or ballast, so you will never need to open the fixture for any maintenance. All of the technology is in the tubes, so and kind of maintenance is just like screwing in a light bulbs. LED Tubes & Fixture are both warrantied for 5 years and should last for 25 years at 40 hours / week. This is the last light fixture you will ever need. Brighter than T8 fluorescent. Almost as bright as T5HO initially, but will be brighter than a T5HO bulb after the T5HO has been used for approx. LED's don't degrade like fluorescent. It will take 25 years at 40 hours per week for these LED's to degrade down to 70% output (about 6 months to a year on fluorescent tubes). OA: 48.00 long X 4.30 wide X 3.00 deep. UL Listed, CEE Certified. No External Ballast or Driver. Cold rolled steel tray in baked white enamel. Wired w/ lampholders set in place. Bulb Type: LED T8 X 3 (included). Base Type: G13 - Medium Bi-Pin. Lens: Clear or Frosted, no hot spots. 40% Less than T8 Fluorescent. Surface mount or chain hang. Applications: Warehouse lighting, industrial lighting, commercial lighting, manufacturing lights, schools lighting, garage lighting, sport facility lighting, and big box facility lights. Works on 110V, 120V, 240V, 277V (anything on or between 110V and 277V). 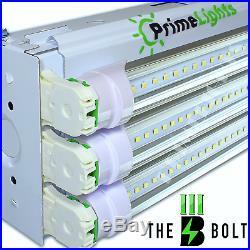 This listing includes fixture & LED tubes - Always! For a professional lighting layout, please call customer service 5128431383. Please be prepared to tell us the following: Height, mounting height, width, depth, reflectivity, and application of the building (to determine proper light levels). DLC Approval is Required for Most Rebate Programs. Promotes quality, performance and energy efficient commercial sector lighting solutions through collaboration among its federal, regional, state, utility, and energy efficiency program members, luminaire manufacturers, lighting designers, and other industry stakeholders throughout the US and Canada. The DLC is a project of Northeast Energy Efficiency Partnerships (NEEP), a regional non-profit which has been bringing stakeholders together since 1996 to accelerate efficiency solutions to create lasting change in the marketplace. 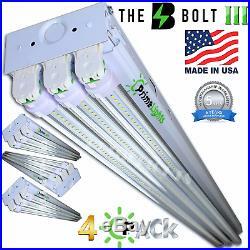 The item "4 PACK LED SHOP LIGHT 4FT Utility Ceiling Light Fixture 5000K Daylight USA MADE" is in sale since Tuesday, July 31, 2018. This item is in the category "Home & Garden\Lamps, Lighting & Ceiling Fans\Chandeliers & Ceiling Fixtures". The seller is "austinlights" and is located in Austin, Texas. This item can be shipped to United States.